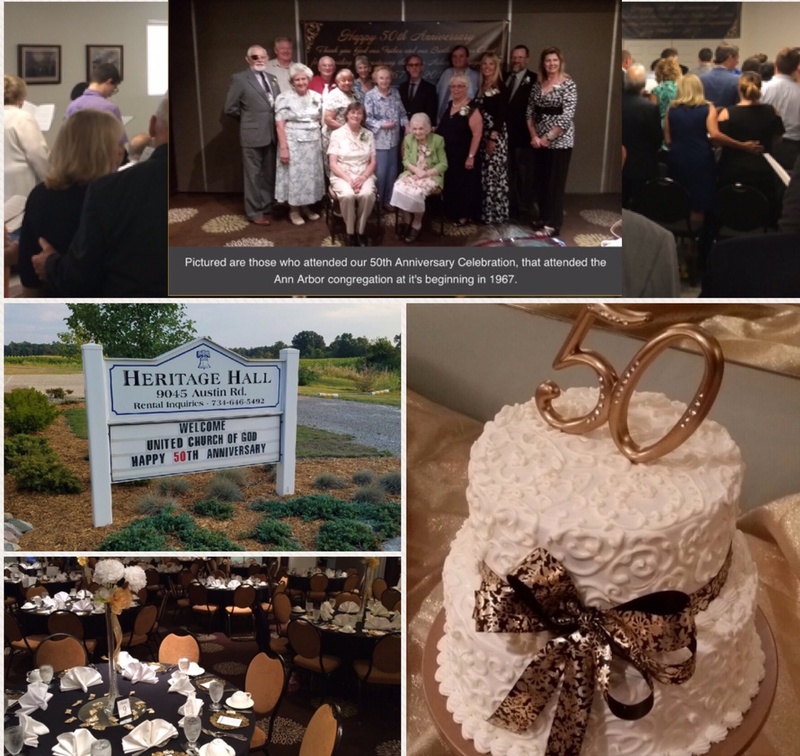 The Ann Arbor, Michigan, congregation commemorated its 50th anniversary on July 22 with a special Sabbath service and an elegant dinner. Collage of photos from the 50th anniversary party in Ann Arbor, Michigan. Our meeting together for the first time was in January of 1967. The first service was held in a small elementary school in Saline, Michigan, and later moved to the Saline High School auditorium. Many pastors, associate pastors, ministerial assistants and trainees served in the area. Following services, we met at Weber’s Inn in Ann Arbor amid elegant surroundings, where we enjoyed delicious fine food, including hors d’oeuvres, a three entrée buffet, mini desserts and a lovely celebration cake. A group photograph was taken of those at the dinner who also attended the first meeting of the Ann Arbor congregation in 1967. Many expressed how wonderful it was to see so many longtime friends and enjoyed conversations into the evening. It was a joyous day, giving glory, honor and thanks to our Father and our Lord Jesus Christ for their abundant blessings given to the Ann Arbor congregation for the past 50 years. A huge “Thank you” to all those who gave their time planning and preparing for this special day. Posts and announcements from the editor of the United News.